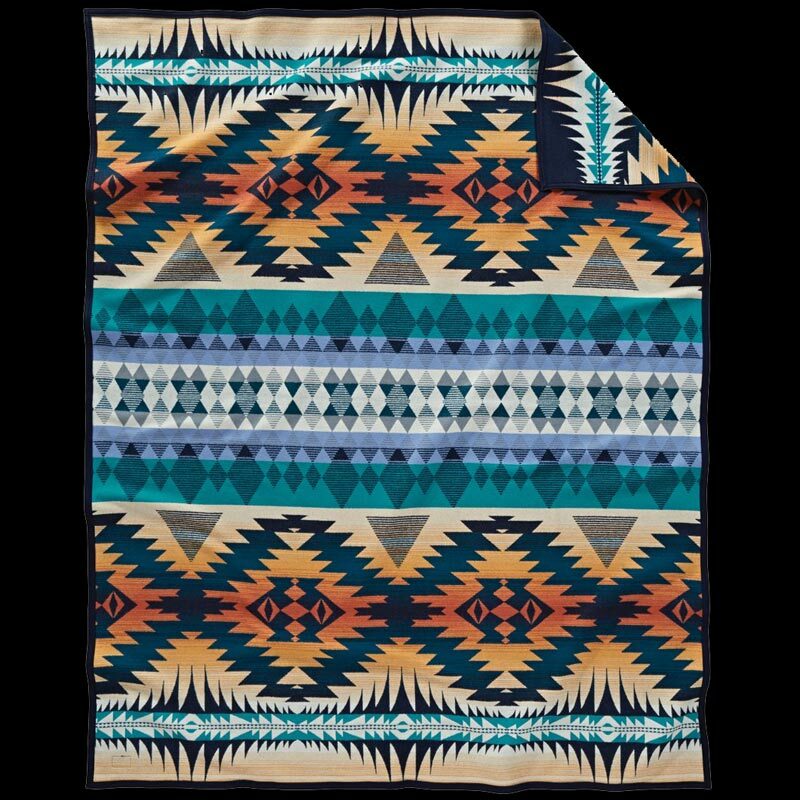 Night Dance Pendleton wool blanket has a dazzling geometric pattern in bright colours. Night Dance celebrates the Stomp Dance performed by many tribes including the Caddo, Seneca, Muscogee, Cherokee, Shawnee and Seminole. This blanket is reversible giving a different colour emphasis. 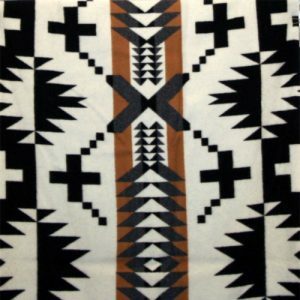 The role of the blanket is woven deep in the history of Native Americans. For centuries it has been used for warmth, as a medium of exchange, for artistic expression and as an important element of ceremonies and recognition. 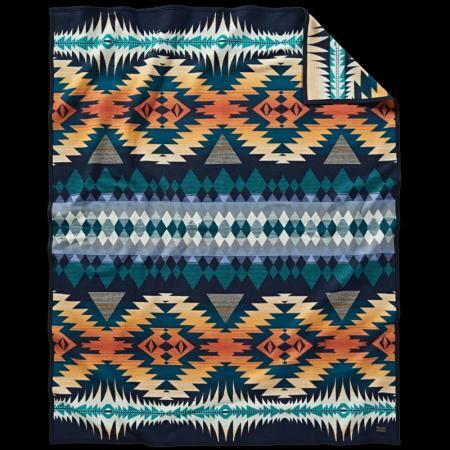 In 1909 Pendleton Woolen Mills began weaving what became known as Indian Trade Blankets on its new jacquard looms. Their brilliant colours and sharp details were in great demand. 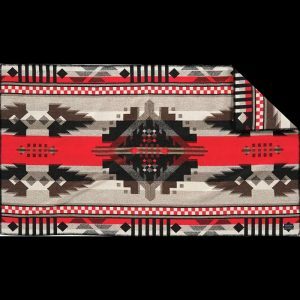 Pendleton weavers and designers worked with their Native American customers to develop colour and design preferences. 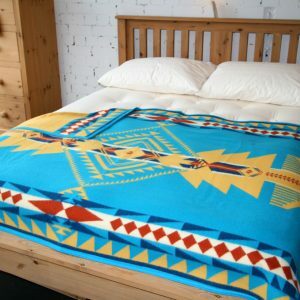 Today, that tradition of complimentary creation lives on in Pendleton Indian Robes and Shawls, still woven from the finest fleece wool, meant to be used and cherished from generation to generation. 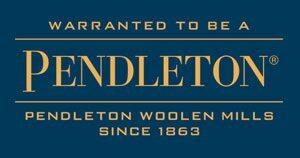 Pendleton Woollen Mills weave the symbols and stories of Native America into fabulous woollen masterpieces. These blankets, ‘robes’ and shawls have become traditional honouring gifts for Native Peoples. Rights of passage such as births, coming of age, graduation, marriage, major milestones and accomplishments are all marked with the giving of a blanket. Not only are ‘Pendletons’ used daily in the home but they are also worn for ceremonies, celebrations and feast days.